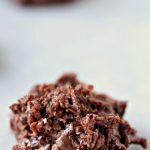 Super easy to make and packed with chocolatey goodness! 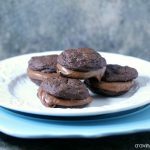 You are going to love these Chocolate Fudge Brownie cookies! I am so sad Cookie Week is over. This week has been a blast. My house is full of cookies. My family is happy as can be. My pants are not so happy. I swear I heard my zipper whispering “help me” yesterday. Thank goodness for jammies with elastic waistbands. I’d be lost without them. I considered making next week Salad Week, but then I realized you can’t put cookies on salad. I think that might be socially unacceptable. So I’m out. So much for salad week. It didn’t stand a chance. However we have lots of yummy things coming up. Homemade Snickers are happening tomorrow. 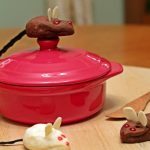 I also have a great Slow Cooker recipe for you on Saturday as well. I made a cutie-patootie Ice Cream Cake in the summer that is going up on the blog on Sunday. Mini-me’s favourite recipe in the world is Chocolate Hot Cross Buns, those will be on the blog on Monday. See, no salad. What is wrong with me? Um, nothing. I like sugar. Sue me. Speaking of sugar, if you like to mix it up with your sugars you’re going to love this recipe. 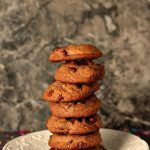 I took a few of my favourite cookie recipes and combined them to make this one. 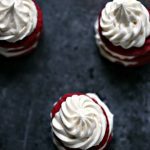 This recipe uses 3 different kinds of sugar. Why? Because they each add a different flavour and they also change the way the recipe performs. I wanted this recipe to have depth, to have some crunch on the outside but be soft on the inside. So I packed it full of lots of great stuff to make all my cookie dreams come true. In a large bowl mix together the flour, baking powder and salt. In a stand mixer combine the butter with the sugars and dry brownie mix. Cream until smooth. Add the vanilla extract, and egg. Mix again until combined. Add the dry ingredients slowly to the mixer while it's on low speed, mix until combined. Turn mixer off, and remove the bowl. Add the chocolate chips and chocolate pieces to the bowl, mix with a spoon just enough to have them mixed in the batter evenly. Spoon or use your hands to place each mound on the cookie sheets. For these cookies I like to make round balls. I don't like to flatten these cookies. Place the first batch in the oven on the middle rack, bake for about 8 to 10 minutes, spin the pan halfway through the cooking time. If you make them larger you can increase time to 12 minutes. Place next batch in oven and bake for the same amount of time. Allow each batch to cool for about 5 minutes on the cookie sheet. 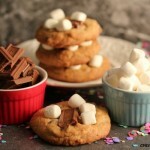 You are going to love these cookies. I know we sure do. I hope you enjoyed Cookie Week as much as we did. Be sure to tune in for Holiday Baking Week (formerly known as Christmas Week) from December 15 to 19. We’re already whipping up tons of amazing holiday baking recipes to share with you. HEAV-ENNNNN! 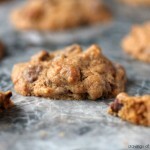 Love the texture and chocolatey yumminess of these cookies! These cookies are the bomb! I’m getting stretch pants. 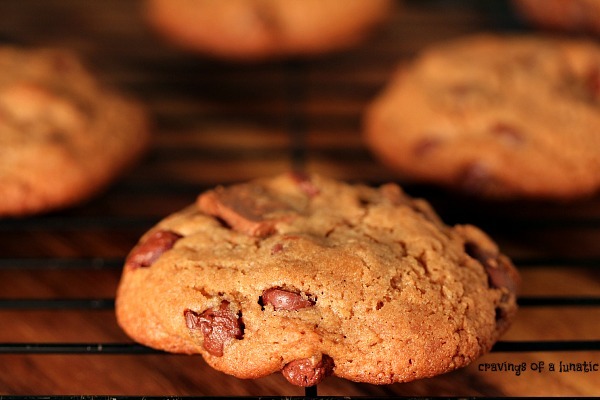 Love the gorgeous golden brown of these cookies, Kim. Three sugars and two different chocolates! Chewy cookies are the best. Triple sugar, triple chocolate! How could these be anything but spectacular. My chocoholics would definitely approve. I am sorry that cookie week is over too. It’s been fun with all the recipes popping out. A brownie as a cookie? Awesome! ! Anything with chocoately goodness is okay in my book. I never thought of keeping brownie mix to use just to use as a partial in recipes. Really good idea and … people do like cookie week better than salad week. I’ll take two dozen of these, delicious!!! “Chocolate fudge brownie” is all I needed to hear. I’m sold! The zippers on my pants talk to me A LOT during the holidays. I feel your pain. 🙂 That being said, these cookies look well worth the uncomfortable waistlines. That’s what sweatpants are for, right? Oh man, these look so rich and delicious! Can an entire batch of these please appear in front of my face right now??!! Salad week never stood a chance – ha ha ha! Well, I’m just happy to have a week’s worth (okay and then some) of cookie recipes to guide me through the holidays. These sound super tasty. I think I have all of the ingredients in my pantry and I think I need these in my life NOW. 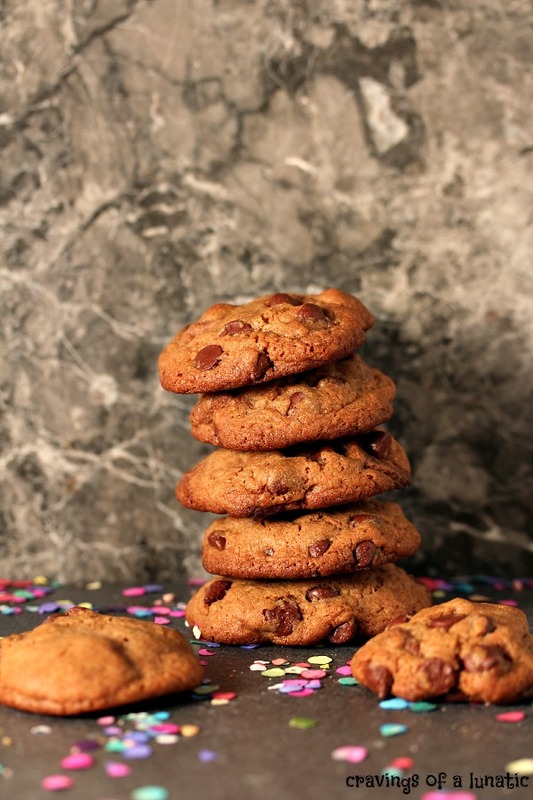 I swear – your recipes are some of the best Kim – I need a plate of these cookies ASAP!! These cookies!! Dang, girl… Mmm. After Cookie Week I considered Salad Week, but Thanksgiving is around the corner. I’ll just buy a couple pairs of maternity pants and revisit salad week in January. Amaze-balls! I would like a whole pile of these right now!